“An Exceptional Hatred? Comparing Antisemitism in Germany and America After the First World War,” Antisemitism Studies. Appearing Spring 2019. “‘No Jews, Dogs, or Consumptives’: Comparing Anti-Jewish Discrimination in Late-Nineteenth-Century Germany and the United States,” in Nineteenth Century Antisemitism in International Perspective, Vandenhoeck & Ruprecht, 2019. “The Deeper the Roots, the Deadlier the Antisemitism? Comparing Images of Jewish Financial Control in Modern Germany and the United States,” in Jonathan Adams and Cordelia Heß, eds., The Medieval Roots of Antisemitism: Continuities and Discontinuities From the Middle Ages to the Present Day. New York: Routledge, 2018. “One Crisis Behind? Rethinking Antisemitic Exceptionalism in the United States and Germany,” American Jewish History vol. 97, no. 3 (July 2013): 235-258. “Klansmen in the Fatherland: A Transnational Episode in the History of Weimar Germany’s Right-Wing Political Culture,” Journal for the Study of Radicalism, vol. 7, no. 1 (2013): 61-78. “The Paranoid Style in Antisemitic Journalism: Comparing Coverage of the ‘World Jewish Conspiracy’ in the Völkischer Beobachter and the Dearborn Independent, 1920-1923,” in Michael Nagel and Moshe Zimmermann, eds., Judenfeindschaft und Antisemitismus in der deutschen Presse über fünf Jahrhunderte/Five Hundred Years of Jew-Hatred and Anti-Semitism in the German Press, 2 vols. Bremen: Edition Lumière, 2013. “The Dearborn Independent,” “Social Justice,” in Wolfgang Benz, hrsg., Handbuch des Antisemitismus, Judenfeischschaft in Geschichte und Gegenwart, Bd. 6 “Zeitungen und Zeitschriften.” Munich: K. G. Saur, 2013. “Ku Klux Klan,” “Silver Shirts,” “The Christian Front,” “The John Birch Society,” “The Mothers’ Movement” in Wolfgang Benz, hrsg., Handbuch des Antisemitismus, Bd. 5 “Organisationen, Institutionen, Bewegungen”. Munich: K. G. Saur, 2012. “General Order #11,” “The Leo Frank Affair,” “The Rosenberg Trial” in Wolfgang Benz, hrsg., Handbuch des Antisemitismus, Bd. 4 “Erreignisse”. Munich: K. G. Saur, 2011. Bismarck’s Shadow: The Cult of Leadership and the Transformation of the German Right, 1898-1945. Oxford: Berg Publishers, 2005. “From the Beer Halls to the Halls of Power: The Cult of Bismarck and the Legitimization of a New German Right, 1898-1945,” German Studies Review vol. XXVI, no. 3 (October 2003). Jockusch, Laura. Collect and Record! Jewish Holocaust Documentation in Early Postwar Europe. Oxford: Oxford University Press, 2012. Reviewed for German Studies Review, vol. 38, nr. 1 (2015): 216-217. Grady, Tim. The German-Jewish Soldiers of the First World War in History and Memory. Liverpool: University of Liverpool Press, 2011. In Special Issue of Seminar: A Journal of Germanic Studies. 50.1 (February 2014), Representations of War Experiences from the Eighteenth Century to the Present. Ed. Stephan Jaeger and Susanne Vees-Gulani, 128-131. Müller, Frank Lorenz. Our Fritz: Emperor Frederick III and the Political Culture of Imperial Germany. Cambridge, MA: Harvard University Press, 2011. Reviewed for American Historical Review, 117 (2012): 1681-1682. Baumgarten, Murray, Kenez, Peter, Thompson, Bruce, eds. Varieties of Antisemitism: History, Ideology, Discourse. Delaware: University of Delaware Press, 2009. Reviewed for Journal of Holocaust and Genocide Studies, Vol. 24, no. 3 (2010): 486-488. Wolfram Pyta. Hindenburg: Herrschaft zwischen Hohenzollern und Hitler. Munich: Siedler Verlag, 2007. Reviewed for H-German: http://www.h-net.org/reviews/showpdf.php?id=23665. Thomas Rohkrämer. A Single Communal Faith? The German Right from Conservatism to National Socialism. New York: Berghahn, 2007. Reviewed for H-German: http://www.h-net.org/reviews/showpdf.php?id=25019. “The Globalization of Hate: America, Germany, and the Rise of Modern Antisemitism, 1880-1914,” presented at the conference, “After the Election: Antisemitism and Racism in the United States,” presented at the Technical University Berlin and Indiana University Gateway Berlin, Germany, June 14-15. 2017. “The ‘International Jewish Traitor?’ Antisemitism, Globalization, and the Question of National Belonging in Germany and the United States,” presented at the conference, “Contesting Jewish Loyalties: The First World War and Beyond,” at the Jewish Museum, Berlin, Germany, December 15-17, 2016. “A Transnational Jewish Question: Understanding the Rise of Modern American Antisemitism in the Context of Late-Nineteenth-Century Globalization,” presented at the conference, “Re-Framing American Jewish History and Thought: New Transnational Perspectives,” at the School of Jewish Theology, University of Potsdam, Germany, July 20-22, 2016. “Jewish Danger and Yellow Peril: Antisemitism and Chinese Exclusion in Germany and the United States in an Age of Globalization,” presented at the conference, “Modern Antisemitism(s) in the European and Colonial Peripheries, 1880s-1945,” at the Vienna Wiesenthal Institute for Holocaust Studies, Vienna, Austria, November 30 – December 2, 2015. “‘No Jews, Dogs, or Consumptives’: Comparing Anti-Jewish Discrimination in Late-Nineteenth-Century Germany and the United States,” presented at the conference “Nineteenth-Century Antisemitism in International Perspective,” at the German Historical Institute, Paris, France, October, 2015. “Jews, Germans, and Bolsheviks: The Politics of American Antisemitism in World War I,” presented at the conference, “Radikalisierung des Antisemitismus während des Ersten Weltkrieges? Antisemitische Akteure und jüdische Kriegserfahrungen im europäischen Vergelich,” at the Center for Research on Antisemitism, Technical University Berlin, March 18-20, 2015. “The Deeper the Roots, the Deadlier the Antisemitism? Comparing Images of Jewish Financial Control in Modern Germany and the United States,” presented at the conference, “The Medieval Roots of Antisemitism,” at the Royal Swedish Academy of Letters, History, and Antiquities, Stockholm, Sweden, February 9-11, 2015. “International Fears of an International Jewish Conspiracy: Antisemitism in Germany and the United States in the Aftermath of the First World War,” presented at German Studies Association Conference, Denver, CO, October 3, 2013. “The Enemy at Home: Antisemitism, Nationalism, and Anti-Communism in Germany and the United States, 1914-1924,” presented at the international conference, “Anti-Semitism in Central Eastern Europe: Ideas, Politics and Praxis of Jew-Hatred from a Comparative Perspective, ca. 1880-1939,” German Historical Institute, Warsaw, Poland, May 17, 2013. “The Paranoid Style in Antisemitic Journalism: Comparing Coverage of the ‘World Jewish Conspiracy’ in the Völkischer Beobachter and the Dearborn Independent, 1920-1923,” presented at conference “Five hundred years of Jew-Hatred and Anti-Semitism in the German Press: Manifestations and Reactions,” Bremen, Germany, May 2010. “Antisemitismus in Deutschland und den USA, 1871-1945: Ein geeigneter Fall zum Vergleich?” Talk delivered as part of Research Colloquium at the Zentrum für Antisemitismusforschung (Center for Research on Antisemitism), Technical University, Berlin, July 1, 2009. “Combating ‘International Jewry’: Radical Antisemitic Attacks on the Roosevelt Administration in Germany and the United States, 1933-1945,” German Studies Association Conference, Minneapolis, Oct. 2008. “From Stormtroopers to Klansmen? A Transnational Episode in the History of German Right-Wing Political Culture,” presented at German Studies Association Conference, San Diego, CA, October 2007. “’Bismarck come back!’ ‘Bismarck stay home!’: The Role of the Bismarck Image in German Political Culture in the Wake of the First World War, 1918-1923,” presented at American Historical Association Conference, Washington, D. C., January 2004. “Conspiracies, Cabals, and Catastrophe: Self-Perception of German History and the Paranoid Style of Politics, 1870-1945.” Midwest German Historians’ Workshop, University of Illinois, Urbana-Champaign, October 17-19, 2003. 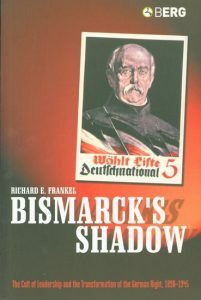 “Bismarck’s Shadow: The Cult of Leadership and the Transformation of the German Right, 1898-1945,” Politics & Society Colloquium of the Center for West European Studies at the University of Washington, May 15, 2002. “Celebrating Bismarck, Opposing the State: Bismarck-Ritual and Populist Rhetoric in German Political Culture, 1890-1933,” with Steven Pfaff (University of Washington, Seattle), presented at the Social Science History Association Conference, Chicago, November 15-18, 2001. “Radicalizing Bismarck: The Iron Chancellor as Counter-Revolutionary Icon and the Struggle Against the Weimar Republic,” presented at German Studies Association Conference, Houston, October 5-8, 2000. “The Charismatic Placeholder in German Political Culture: Otto von Bismarck and the Crisis of German Leadership, 1898-1945,” Social Science History Association Conference, Pittsburgh, Oct. 26-28, 2000. “An Unholy Trinity: Nationalism, Anti-Semitism, and Homophobia in the Harden-Moltke Trial of 1907,” European History Section of Southern Historical Association Conference, Birmingham, Nov. 13, 1998. Panel Discussant: “German National Identity and Nationalism,” at the nineteenth Annual World Convention of the Association for the Study of Nationalities (ASN), Columbia University, New York City, April 24-26, 2014. Panel Discussant: “Fascism and Nazism in the Early 20th Century: Diffusion and Resistance,” at the eighteenth Annual World Convention of the Association for the Study of Nationalities (ASN), Columbia University, New York City, April 19-21, 2013. Panel Discussant: “German Conceptions of Space in the Nineteenth and Twentieth Centuries,” at the Seventeenth Annual World Convention of the Association for the Study of Nationalities (ASN), at Columbia University, New York City, April 19-21, 2012. Panel Chair: “Entangled Histories: German-Yugoslav Relations Before, in, and After World War II,” at the Seventeenth Annual World Convention of the Association for the Study of Nationalities (ASN), at Columbia University, New York City, April 19-21, 2012. Panel Discussant: “Claiming National Dominance in Central Europe, 1890-1945,” at the Sixteenth Annual World Convention of the Association for the Study of Nationalities (ASN), at Columbia University, New York City, April 14-16, 2011. Panel Moderator: “Antiziganismus”: Vorurteil und Wahrnehmung rumänischer Roma. Conference organized by the Center for Research on Antisemitism at the Technical University, Berlin. July 10, 2010. Panel Discussant: “Central European Fascisms: Images, Perceptions, and Internal Dynamics” at the Fourteenth Annual World Convention of the Association for the Study of Nationalities (ASN), at Columbia University, New York City, April 23-25, 2009. Organized Panel: “Radicalizing the Nation: The Impact of the First World War on German Nationalism and Political Culture” for the American Historical Association Conference, Washington, D. C., January 2004. Panel sponsored by Conference Group on Central European History. Organized Panel: “In the Name of the Nation: Populism and Political Mobilization in Germany, Great Britain, and the United States in the 19th and 20th Centuries” for the Social Science History Association Conference, Chicago, November 15-18, 2001. Organized Panel: “Nationalists Against the State: The Political Culture of the Radical Right in Weimar Germany” for German Studies Association Conference, Houston, October 5-8, 2000. “The Totalitarian Temptation: What German History Can Teach Us About the Death of Democracy,” delivered as part of the Department of History, Geography, and Philosophy’s Teach-In Series, Dupré Library, February 7, 2017. “When America Closed the Golden Door: From Chinese Exclusion to the Holocaust,” delivered as part of the Department of History, Geography, and Philosophy’s Teach-In Series, Ernest Gaines Center, February 2, 2017. “Decisions in Hell: The Question of Flight and Survival During the Holocaust,” at the Illumination Series at SOWELLA Technical Community College, Lake Charles, Louisiana, Wednesday, November 18, 2015. “The Holocaust in the East.” Presentation and panel discussion introducing the exhibit, “Through Soviet Jewish Eyes: Photography, War, and the Holocaust,” at the Paul and Lulu Hilliard Art Museum, University of Louisiana at Lafayette, October 16, 2014. “Kristallnacht in Context: International Antisemitism in 1938,” part of “Kristallnacht: 75 Years Later. An Evening of Reflection and Remembrance,” at Temple Shalom, Lafayette, LA, November 8, 2013. “Inside Europe’s ‘Heart of Darkness’: World War II and the Holocaust in Eastern Europe,” at Lafayette Public Library, May 4, 2011, as part of their commemoration of Holocaust Remembrance Day, Memorial Day, and Armed Forces Day. “The Experience of Jews and Germans during the Holocaust,” at Northside High School, January 20, 2010 as part of the school’s week-long observance of the Holocaust and the Martin Luther King, Jr. holiday. “The Image of Bismarck in German Political Culture,” at Sommerschule, Wust, Germany, July 20, 2009. “It Couldn’t Happen Here? Comparing Antisemitism in Germany and the United States on the Eve of the Holocaust.” Keynote lecture delivered at the official Yom Hashoah/Holocaust Remembrance Day observance, Southeastern Louisiana University, Hammond, April 22, 2009. “Looking Back on Kristallnacht after Seventy Years: Assessing the Antisemitic Potentials of Germany and the United States, 1914-1945,” delivered on the occasion of the 70th anniversary of Kristallnacht. Temple Shalom, Lafayette LA. November 7, 2008. “Anti-Semitism, Nationalism, and Scandal in Modern Germany,” sponsored by the International Affairs Committee of the Anti-Defamation League. Offices of the Anti-Defamation League, Chicago, IL, June 28, 2005. “Bismarck and the Cult of Leadership.” Frye Art Museum’s “Connections and Context” Series, sponsored by Department of Germanics and the Center for West European Studies, Univ. of Washington. Seattle, Washington, April 21, 2005. University of Louisiana at Lafayette Department of History Guilbeau Summer Research Award, $2500, May 2017. Fellowship, 2016, Jack and Anita Hess Seminar for Faculty: “After the Holocaust: Teaching the Post-War World,” United States Holocaust Memorial Museum, January 4-8, 2016. University of Louisiana at Lafayette Department of History Guilbeau Summer Research Award, $2333, May 2015. University of Louisiana at Lafayette Research Travel Grant, $1,000, December 2014. Nominated by UL Lafayette to Apply for NEH Summer Stipend, 2010, 2012, 2014. Fellowship, 2010, Jack and Anita Hess Seminar for Faculty: “The Holocaust in the Soviet Union: New Sources, New Perspective for Use in Teaching,” United States Holocaust Memorial Museum, Washington, DC, January 4-8, 2010. Peter Hayes Research Fellowship, $5,000, Holocaust Educational Foundation, Summer 2007. Summer Research Award, $4,800, University of Louisiana at Lafayette, Summer 2006. Fellowship, Tenth Annual Summer Institute on the Holocaust and Jewish Civilization, 2005, Northwestern University. DAAD Full Year Fellowship, dissertation research in Germany, 1996-97. DAAD Summer Language Training Fellowship, Goethe Institute, Staufen i. B., Germany, 1994.
Review manuscript proposals for Berg Publishers, Oxford England. Review manuscript proposals for German Studies Review.